This is my Lenten Rose–a hellebore. It’s not supposed to flower at Christmas but it’s darned closed to doing so! It’s supposed to flower around Easter time. Last year it flowered around May (no, as of yet, Easter never comes in May, although it is a movable feast). But that just tells you how unseasonable our weather has been. The perennials are all off kilter. I have seen forsythia in bloom as well. From what I hear, it is our non-natives that are affected. I haven’t stopped to take stock of this but it would stand to reason that that would be true. In any event, while the plants may be a bit disrupted, I am surely enjoying this unusual warmth. I know I will pay for it when I get to Colorado next week however. I have had no time to acclimate! 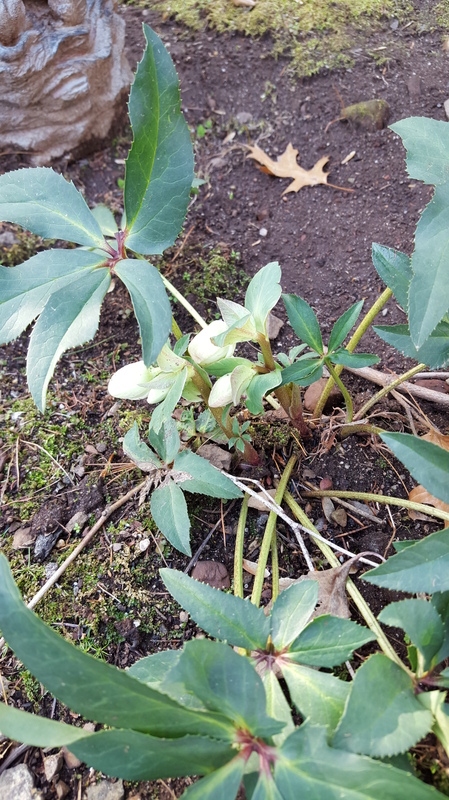 Had 2 Christmas roses (hellebores) blooming in December and have another blooming now! Lovely to see this time of year. Isn’t this amazing? But you are so right –it is lovely to see this time of year. I am enjoying our warm winter (climate change implications aside) after our two last cold and snowy winters.